A DXpedition is an expedition for the purpose of communicating long distances with amateur radio (often called DX). The idea of such an adventure is at least 60 years old dating back to the Kon Tiki, the raft used by Norwegian explorer and writer Thor Heyerdahl in his 1947 expedition across the Pacific ocean from South America to Polynesia. That simple QRP transmitter helped the crew keep in contact with civilization throughout their 101 day voyage. Danny Weil (VP2VB), inspired by the Kon Tiki adventure, was one of the DXpeditioning pioneers making contact with over 100,000 hams around the world on his various trips in his boats YASME and YASME II. The YASME Foundation now assists DXers and DXpeditioners alike by funding scientific and educational projects relating to amateur radio. Since Danny Weil’s time there have been significant advances in technology and DXpeditioning strategies. The “one man in a boat” has been replaced by cargo containers filled with radios, antennas, computers, coax, and many tons of other equipment. DXpedition teams of 10 to 30 operators are not uncommon. While this has been a boon to those looking for a contact from remote places like Peter I, South Sandwich Island, or Kerguelen, the enormous price-tag associated with such endeavors put it out of reach for all but the most affluent or famous. The 100 Pound DXpedition is my answer to this situation. It is a return to basics. The idea is this: with just 100 pounds of equipment, one should be able to set up on some far away place and operate a DXpedition. This weight limit imposes an upper-bound on what can be done. For example, some of the larger DXpeditions try to separate antennas by 1000 or 1200 feet. The weight of 1000 foot of RG-213 coax is about 104 pounds—four pounds over the limit for all equipment on a 100 Pound DXpedition! As artists sometimes say, “Form is freeing.” That is to say that limits help bring focus and illuminate possibilities. With such draconian weight limits you cannot be tempted to bring the big amplifier, tower sections, or huge antennas. Instead, you can begin to research compromises and trade-offs, see what works and what does not, and determine for yourself what is key, what is extra, what is signal and what is noise. In a permanent station you might fight for every dB. But, when every pound counts, do you trade 2 dB for 12 extra pounds? These thinking processes are at the very heart of a 100 Pound DXpedition. Finally, with these limits come rewards. Traveling so light means you and your portable station are just a plane ride away from very interesting places. The 100 pound limit fits within many airline guidelines so a DXpedition can be done by packing, checking your bags, and finding your seat. There are no cargo containers. There are no tedious logistics and freight plans. You can just go, unpack, set up, and have fun. 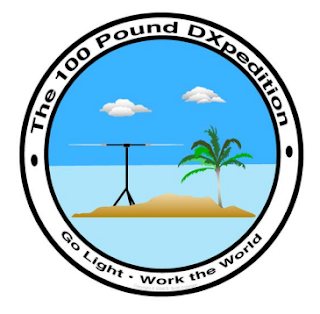 The remainder of this white paper discusses the antenna aspects of a 100 Pound DXpedition. Again, we are not looking for the biggest and best; we are looking for the best “bang for our buck” and best “power per pound.” Welcome to lightweight DXpeditioning. Preparing an antenna for your home station may involve weeks or months of planning and execution. Erecting a tower, for example, may involve obtaining permits from your community’s planning board, digging the footing, filling it with rebar and concrete, and waiting a month for that concrete to cure. Only then can you attach the tower and begin thinking about hoisting the antennas to height. The weight of an antenna system for a home station is rarely of concern except perhaps for the shipping charges for the delivery of the parts. Heavy tower sections or antennas are a minor inconvenience if they require extra hands during assembly. And, once a system is assembled we are rarely interested in how easily it can be disassembled and shipped again. Antennas for DXpeditioning violate many of the assumptions that we might have for antennas in our home station. We care about their weight. We care about assembly and disassembly time and complexity. The antennas must be assembled, disassembled, and shipped repeatedly for us to get value from them. Put more starkly: it doesn’t matter if an antenna performs well if you can’t bring it. Antennas that are too heavy, too complicated, require hefty support structures, or cannot be broken into small (48 inch) pieces cannot be considered for this use. If you plan a trip for a week to some beautiful destination, you cannot afford to spend two days assembling antennas and another disassembling them. Antennas that require that kind of investment might make fine home station antennas, but they are all but useless for lightweight DXpeditioning. • Two checked bags. Some airlines allow three bags (such as Southwest), but the general allowance is two bags for most US carriers. In this age of high fuel prices, some carriers are now charging a fee for the second and even first checked bag. Still, it is a reasonable assumption that two checked bags can be brought without excessive charges. • Fifty pounds per bag. Some airlines are more lax on this point than others. You can also pay to have your bag accepted for weights up to 70 or even 100 pounds. This is helpful when you may be living within the 100 pound combined limit, but one bag is heavier than another. • Size of 62 linear inches. The combined height plus width plus depth of a bag cannot exceed 62 inches. The Pelican 1610 case is one of the largest cases that satisfies this requirement. • Golf and sports bags. There is an exception to the above rules for sports enthusiasts, or at least those of us who use similar equipment. Golf bags, ski bags, and similar equipment bags are exempted from the size restriction and sometimes from the weight restriction. These are general guidelines. Check with your carrier for the specific rules of your airline. A reasonable strategy is to have one hard-sided golf bag for long antenna parts, coax, and other parts, and have a second hard-sided case for the radio, tuner, power supply, and other smaller parts. A third carry-on bag can then hold clothes and other personal items. Remember, you need to count the weight of the equipment and the weight of the bags when budgeting! • Size – This is even more important than weight in some respects. A golf bag will typically accommodate pieces 48 inches in length. If it cannot fit in the bag, it cannot go. So, even very light antennas with 72 inch parts (6 foot lengths) are not useful for our purposes. • Weight – We have a total weight budget of 100 pounds but can divide this between all the equipment in whatever fashion we like. If we wish to bring more radio gear, we will likely need to bring fewer antenna pieces. Similarly, if we bring larger, heavier, or bulkier antennas, we may have to bring fewer or lighter other items to compensate. Weight is always a trade-off in these calculations. • Ease of assembly and disassembly – Some antennas are designed to be assembled once and never disassembled. The use of pop-rivets would be an example of an antenna design decision that would hint at this. The best lightweight DXpedition antennas are ones that can be assembled easily, disassembled easily, and packed easily. Custom bags, containers, and packing materials that would never see use for a home station antenna can be extremely beneficial for a DXpedition antenna. o Multi-band antennas may reduce the deployment time for your antenna systems. For example, if you assemble a 40m antenna that is also effective on 15m, this means you do not need to assemble a specific 15m antenna. Also, trapped verticals or triband yagis provide multiple bands but may not be more complicated or time-consuming to assemble than a similarly designed singleband antenna. The time savings can mean more operating or leisure time in that exotic location. o Multi-band antenna systems require only one run of coax – This is almost trivial for home stations but quite important for a lightweight DXpedition. A discussion of coax trade-offs may be found later in this paper. • The antenna’s physical footprint – Depending on your DXpedition’s destination, there may not be much room to erect antennas. In such cases, antennas with smaller footprints may be more desirable than larger ones. For example, a 􀀁-wave vertical requires radials. If there is no room to run these radials, however, you’ve got a problem. A half-wave vertical dipole does not need radials and can be erected in a very small area. Vertical dipoles have other disadvantages such as being taller (in general) and more difficult to feed (since the feed point is higher and the feed line must be routed carefully to avoid parasitic coupling). The antennas discussed in this white paper conform to these guidelines to varying degrees. Evaluating the antennas is not a straightforward task either for the criteria above, or for performance in the field. Perhaps the criteria above can be used to provide guidance as to whether an antenna is eligible for this service and other criteria can determine its performance in this service. Everything in this white paper is wrong to some degree. In the sciences like physics and chemistry there is a notion of experimental error. The experiment may be intentionally flawed to take advantage of significant simplifications. Results may therefore be representative, but not numerically precise. There is also the concept of measurement error. Even when precise measurements are taken there will always be variations and precision limitations. There will be a great deal of both types of errors in what follows. If this makes you uncomfortable, stop reading now. I will be discussing antenna products and antenna designs that I have used, or considered using, on lightweight DXpeditions. I have spent the last few years gathering practical experience with these antennas and have now augmented that with computer models. modeling engine. Other justifications for this imprecision are more easy to explain: I do not own the antenna in question and have made only guesses (though well-reasoned guesses, to be sure) of some of the values. Finally, never discount the possibility that I just measured wrong, entered the data wrong, or otherwise goofed. trips. I hope they will be as helpful to others. The following models were created with EZNEC 5 from W7EL. This is an extremely powerful piece of software and I can only hope to master some of it over the next few years. Luckily, my immediate needs for this analysis only require understanding the basics of the program. descriptions for each antenna contain notes that describe such compromises when they have been made. Finally, a model is not the thing you are modeling. I will, where possible, provide completely subjective commentary relating to my experience with each antenna. As the common modern day lament goes, “your mileage may vary.” Before we begin with some antennas that we will use as “reference” antennas we shall have a brief discussion about physical measurements. Modeling was done with EZNEC. Direct measurements of some antenna systems were done with the AntennaSmith by Time Wave. (http://timewave.com). A picture of this unit appears below. This device not only measures SWR and other characteristics of an antenna system but also provides plots of this data over specified ranges. Two types of these plots appear below. 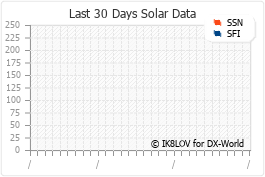 Software accompanying the unit provides for the upload of data and plots to a PC. Where possible, direct measurements have been taken of these antenna systems and these direct measurements appear next to predicted values from our modeling. • Quarter wave vertical antenna – This is a ground mounted antenna fed about 29 inches above ground with 16 radials. • Vertical dipole antenna – This is an antenna that does not require a radial system, is center fed, and can be deployed in even small areas. An antenna of each type is modeled for all five bands 10, 12, 15, 17, and 20 meters. We begin with the quarter-wave vertical. The following antennas are modeled with simple runs of AWG 16 wire. Antennas serving bands 10-20 meters such antennas can be easily constructed with a simple fishing pole holding up the vertical element and radials tied to trees or stakes. Though presented here as a “reference” antenna, these antennas could be used on a 100 Pound DXpedition. The space required to fully deploy the antennas is greater than what we typically expect to have, but if the space is available these antennas are fine choices giving good value for weight, size, and performance. I have used a “fishing pole vertical” for 40 meters (which is also good on 15 meters) and 80 meters on several trips with only two elevated radials with very good results. Since 20-foot fishing poles are available from major sporting good outlets for very little money, these antennas are also a very cost effective way to get on the air in that remote location. The following reference antennas are shown with 16 radials. Even four radials provide a surprisingly good antenna. The reader is encouraged to model these antennas for themselves. In the mean time, we spend the next few sections discussing these simple antennas for 10 through 20 meter bands. A full-sized quarter-wave vertical with radials is one of the simplest antennas to make or model. This example is a 10m vertical antenna with 16 radials. The antenna is fed, and its radials emanate from, a height of 29 inches. This puts the top of the antenna about 12 feet off the ground, easily held by a modestly sized collapsible fishing pole. A Black Widow pole 13 foot in length (with a closed length of 45.5 inches) is less than $11, for example. Longer poles up to 20 feet cost under $20. Such poles would make fine masts to hold up the upper-end of one of these quarter wave verticals.